They say that performing the same tasks over and over and expecting a different result, is the definition of insanity. 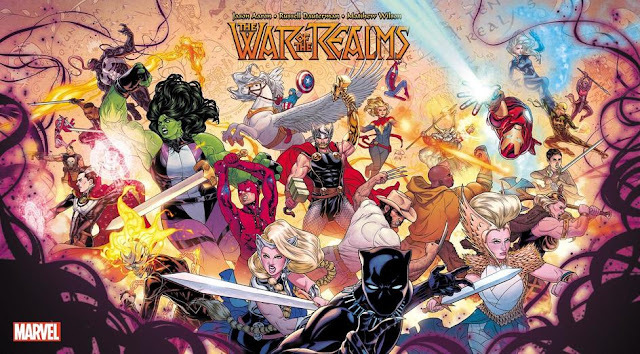 From time to time, I decide that I’m going to do a multipart exploration on a particular series or character, to share my love and passion of those comics with anyone that might not be familiar with them. What almost always happens is that the level of effort starts to outweigh the pay (which is nothing) and my mind slowly becomes untethered. All of this is to say that a person can only type “the Beyonder” so many times before it takes a permanent toll on their soul, so the least you can do is read it, you selfish jerks. 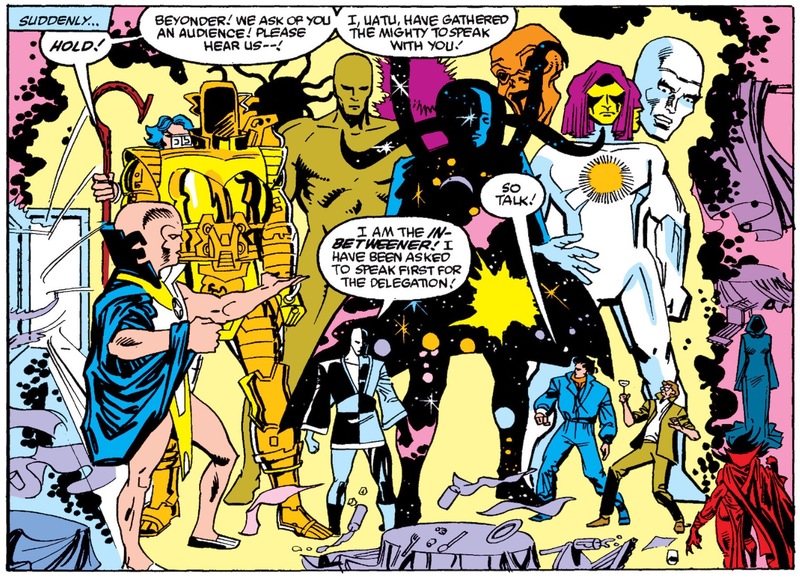 Heartbroken and borderline suicidal, the Beyonder was in a bad place last time out. Let’s see what crazy hijinks he gets into this time. The Beyonder inspects each level of his massive new tower, to include the communications center, the garage, the conference room, and the gardens. Nearby, a reporter at the Daily Sun-Telegraph takes notice of the new addition to the city. The reporter, Dave, drives up to the edge of the tower just in time to see the Beyonder fly off (to assist Power Pack). Conceptual beings that are so vast they can barely be comprehended by the human mind. 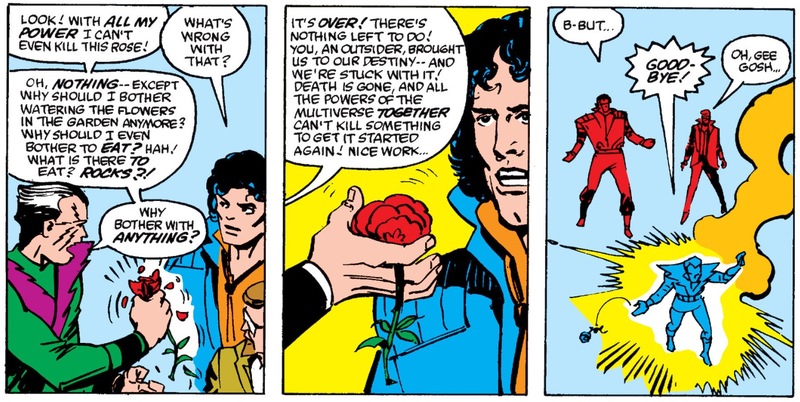 Dave is sufficiently flabbergasted, and having recently been looking for a higher purpose in life, decides he’s going to help the Beyonder in his goal to be a champion for life. Meanwhile, in that same ole’ suburb of Denver, Owen Reece (the Molecule Man) returns home from work more than a little troubled by the Beyonder’s recent activities. 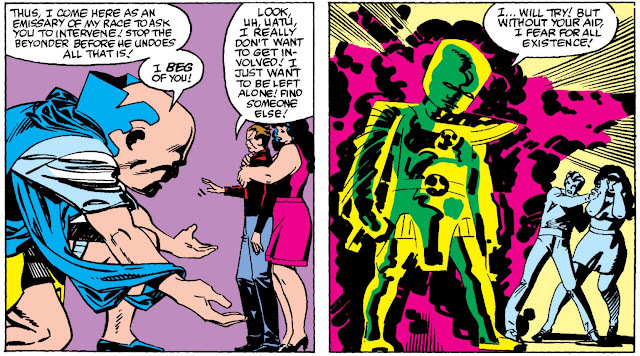 The Watcher is there to convince Owen to intervene in the situation against the Beyonder. 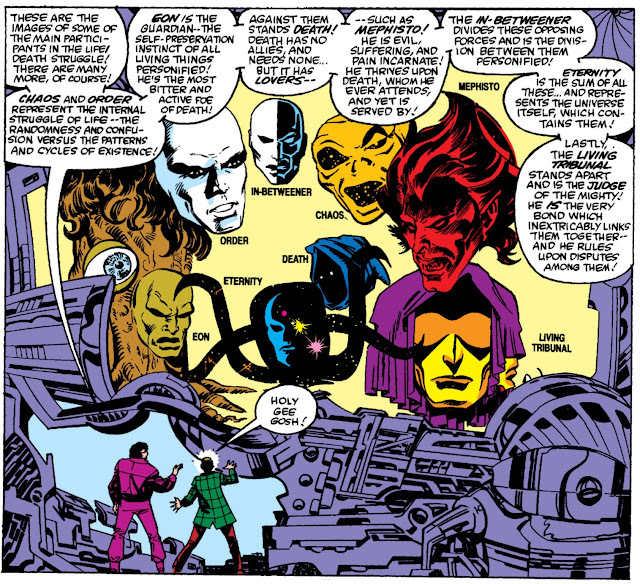 (At one point, he claims that the entire history of the multiverse was merely a prelude to Owen’s rebirth as the Molecule Man. Which is something that I personally have always believed. All of our lives have a clear demarcation line of pre and post Molecule Man awareness. “Are you pre-Molecule Man awareness? Please call our helpful professionals at 1-800-MOL-CULE and they’ll put you on the path to enlightenment today. Call now, and you’ll get a free copy of Micronauts #23.”) Owen declines to help, preferring to be left alone to live his quiet, normal life. 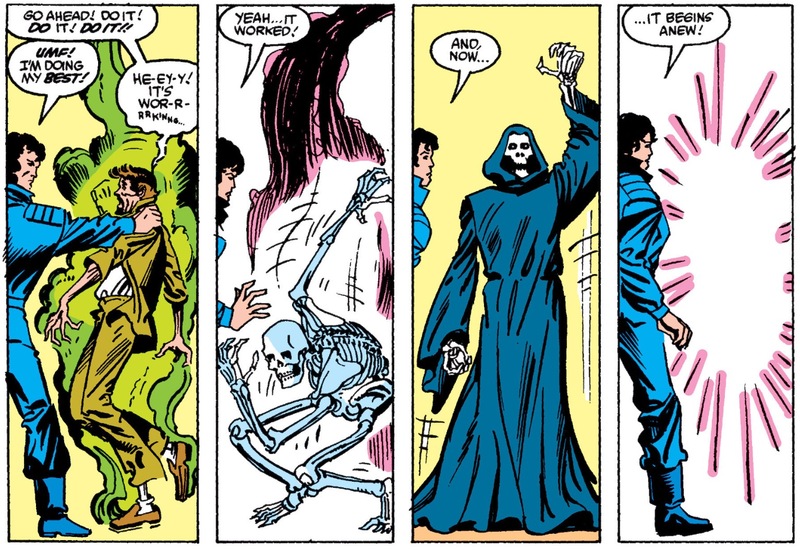 Elsewhere, the Beyonder continues his altruistic work all across the world. When he returns to his headquarters, he expresses some concerns to Dave about still not quite being able to discern his role in the multiverse. That’s when Captain America arrives, flanked by Mister Fantastic, to have a rousing discussion about truth, honor, and freedom. They are concerned that the Beyonder is doing too much, that he is upsetting the natural order of things. They’re fearful that the human race will come to rely on him too much. Following the press conference, the Beyonder thanks Dave for inspiring him, and takes steps to do exactly what Dave promised. 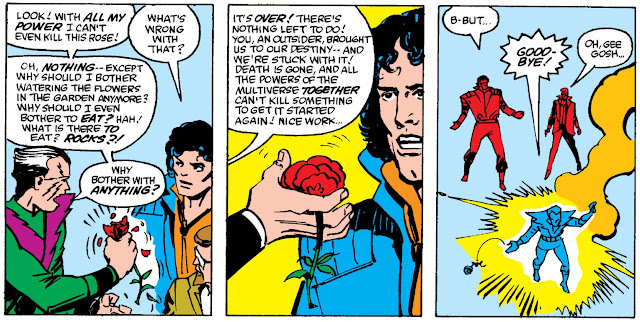 The Beyonder has decided to follow through on Dave’s boasts, by eliminating Death from the equation. He laces a cup of wine with his own energies, which when sipped, will remove the spectre of Death from the universe. 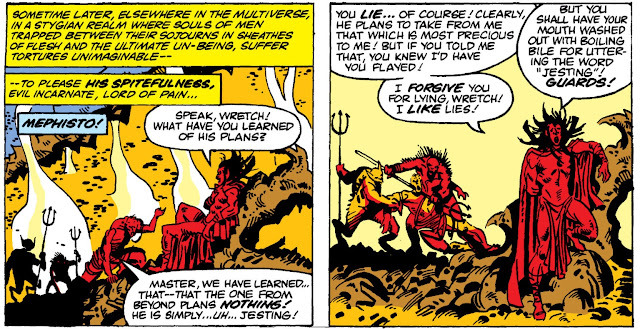 Mephisto suddenly arrives with a pack of demons, in an attempt to stop them, but the Beyonder easily neutralizes his threat. Death drinks deep, and disintegrates into nothingness. Now nothing will ever die again. At that same moment, far away, the Molecule Man takes notice of this event, and he is pissed. He instantly teleports over to confront the Beyonder and his lackey. He lectures the Beyonder about eliminating Death. Removing Death has removed the ultimate consequence from life, and therefore there is little purpose left in doing anything. 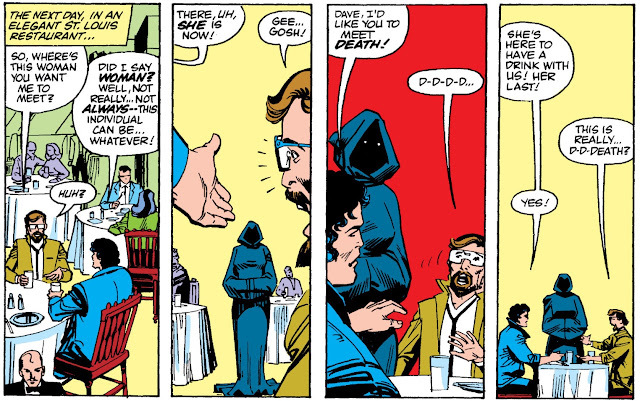 Dave finally comes to terms with exactly what he did, and begs the Beyonder to reverse it. He cannot, but there may be a way to restore Death if a sentient being were willing to take on the responsibility of the role. 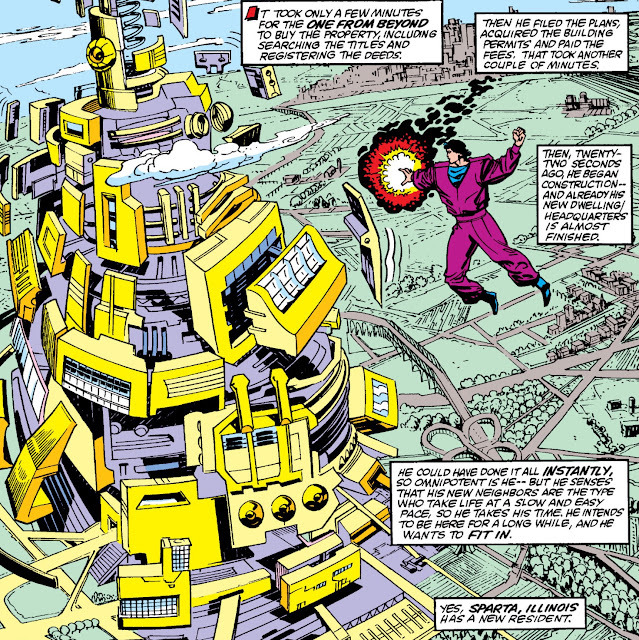 The Beyonder disassembles his headquarters, preferring to wipe away this chapter of his life. He admits that even for an omnipotent being, he just feels exhausted. Things are not looking good for our wayward cosmic being. Everything he’s tried to do has ended in disaster. The woman that he fell in love with (Dazzler) rejected him. His only friend (Boom Boom) betrayed him. He followed Dave’s advice and it led to his friend sacrificing his eternal existence. He has a right to feel exhausted, and sometimes feeling exhausted can lead to a feeling of hopelessness. Which can only mean bad things when you have the power of a god. Next week, I type “the Beyonder” many more times.